May 26, 2017 – Princess Cruises has debuted its 2018-2019 Exotics program which will take guests to culturally rich and iconic cruise destinations around the globe. 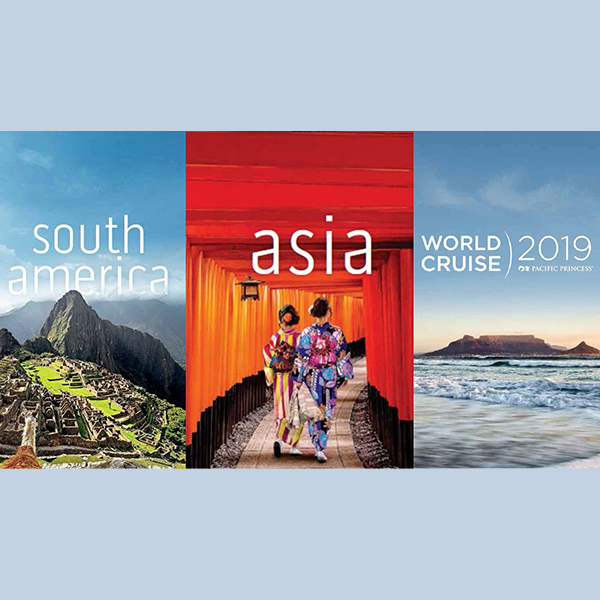 With more than 50 departures, ranging in length from three to 111 days, these worldwide cruise itineraries go on sale today. The diverse deployment includes six ships sailing on 27 unique itineraries throughout five continents, visiting 93 destinations and 47 countries. Guests can book cruises to South America, Southeast Asia and China. In addition, cruisers will experience less-traveled ports aboard the cruise line’s small ship that will circumvent the globe on a 111-day World Cruise sailings roundtrip from Los Angeles or Ft. Lauderdale. OCEAN Medallion-enabled Royal Princess sails her maiden voyage around Cape Horn on a 49-day South America Grand Adventure – the cruise line’s largest ship ever to visit South America. Guests will experience the highly anticipated, wearable device powered by a first-of-its-kind interactive technology platform within the One Cruise Experience Access Network™. (O·C·E·A·N™), making possible a new level of personalization that delivers an enhanced guest experience not previously available in the global vacation industry. Coral Princess sails a new 60-day Circle North Pacific voyage roundtrip Los Angeles, calling to 22 destinations in 8 countries, including Asia, Alaska and Hawaii. Pacific Princess sails a new route on the 111-day World Cruise circumnavigating the Africa’s Cape of Good Hope. Two new 14- and 15-day Grand Asia voyages on Sapphire Princess sailing out of Shanghai and Singapore, complement the previously announced 14-day Majestic Grand Asia voyages on Princess Cruises’ newest ship, Majestic Princess. MORE ASHORE evening stays and overnights will be offered on select itineraries in 18 ports across 5 continents. Guests will enjoy bucket-list destination to more than 20 UNESCO World Cruise Heritage Sites, including Glacier Bay National Park, Singapore Botanical Gardens, Komodo National Park, Great Barrier Reef, Robben Island in Cape Town and more. Guests can choose from three ships, sailing 18 itineraries to 34 destinations, from four homeports with 31 departures, ranging from three to 60 days. Diamond Princess and Sapphire Princess both return to homeport in Singapore together for a season of cruises ranging from three to 21 days, with stops in Vietnam, Thailand, Malaysia and Indonesia. For the Christmas and New Year’s Eve holidays, Diamond Princess sails a 10-day Southeast Asia and 11-day Malaysian Peninsula & Indonesia voyage, which can be combined for a 21-day vacation. Additionally, Sapphire Princess sails a 15-day Grand Asia voyage, featuring an overnight in Hong Kong. For the 2019 Lunar New Year, Sapphire Princess will be sailing a seven-day Vietnam & Thailand voyage (roundtrip Singapore). In South America, two ships sailing seven itineraries to 25 destinations from 4 homeports, with 15 departures ranging from 14 to 49 days are offered. OCEAN Medallion-enabled Royal Princess sails her maiden voyage to South America on a 49-day South America Grand Adventure, sailing from Ft. Lauderdale to Los Angeles. In addition, Emerald Princess returns to South America, navigating around Cape Horn on five departures between Santiago (Valparaiso) and Buenos Aires. Royal Princess and Emerald Princess both feature Peru, Chile and an overland to Machu Picchu on the 16-day Andes & South Americacruises between Los Angeles and Santiago (Valparaiso), which can be combined with a 14-day Cape Horn cruise for a 30-day Andes & Cape Horn Grand Adventure. Both ships also sail 19-day Brazilian Adventure cruises between Fort Lauderdale and Buenos Aires, which can be combined with the 14-day Cape Horn cruises for a 33-day Cape Horn & Brazil Grand Adventure. Pacific Princess offers a 111-day World Cruise voyage roundtrip from Los Angeles or Ft. Lauderdale, with 41 destinations, in 27 countries on 5 continents, featuring a circumnavigation around the Cape of Good Hope with overnights in Cape Town and Singapore. The cruise includes three maiden ports of call to Stewart Island (New Zealand), the remote island of St. Helena (U.K. territory) and Guadeloupe (Pointe-à-Pitre). For a shorter world voyage, Pacific Princess offers the opportunity to sail a 96-day World Cruise embarking in Los Angeles and disembarking in Ft. Lauderdale. Princess Cruises also offers the opportunity to join the World Cruise for a portion of the journey including a 72-day South Pacific & Indian Ocean, 43-day Australia & Africa, 39-day Africa, South America & Panama Canal, 29-day Hawaii & South Pacific, 24-day Africa & South America and a choice of two 15-day Panama Canal Connoisseur voyages sailing between Los Angeles and Ft. Lauderdale. To further enhance the cruise vacation, Princess Cruises is pleased to offer two cruisetours for South America on Emerald Princess and Royal Princess. During the Iguazú Falls Adventure cruisetour, guests visit Rio de Janeiro with a full-day sightseeing tour taking them to Sugar Loaf Mountain and Christ the Redeemer statue. The tour continues into the jungle at the border of Brazil and Argentina to incredible Iguazú Falls, a UNESCO World Heritage Site. During the Machu Picchu Explorer cruisetour, guests ascend into the Andes to magical Machu Picchu, another UNESCO World Heritage Site and visit the historic city of Cusco and the Sacred Valley with sightseeing to Sacsayhuaman, Ollantaytambo and an authentic Pisac Market. One of the best-known names in cruising, Princess Cruises is a global cruise line and tour company operating a fleet of 18 modern cruise ships renowned for their innovative design and wide array of choices in dining, entertainment and amenities, all provided with the experience of exceptional customer service. A recognized leader in worldwide cruising, Princess carries 2 million guests each year to more than 360 destinations around the globe on more than 150 itineraries ranging in length from three to 111 days. The company is part of Carnival Corporation & plc (NYSE/LSE: CCL; NYSE: CUK).